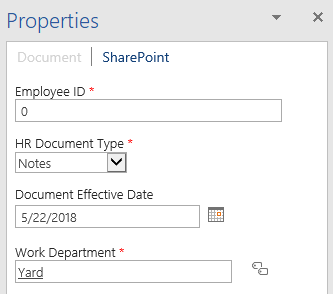 Originally announced by Chris McNulty in the Updating content management for the cloud in the Microsoft Tech Community, the Document Information Panel (DIP) returns to Word 2016 for SharePoint. It's now called the Word SharePoint Properties Pane (WSPPP), is only available in Word 2016 - as the name would suggest - and is implemented by way of an Office Add-In. There are more than a few organizations that have held on to their old Office installations specifically to retain the DIP functionality - manipulating SharePoint metadata directly within the Office client application makes for a streamlined user experience. And for anyone attempting to increase the use of metadata in SharePoint knows, reducing the effort required is half the battle. The WSPPP Add-In will automatically work for content in SharePoint Online and OneDrive for Business libraries, but you need to be running the December 2017 Cumulative Update in SharePoint 2013 and 2016 on-premises environments. One item to note is that the WSPPP Add-In panel only displays once the document is saved, if it's clicked prior to save the 'Office Backstage' is displayed and you're able to set any properties and then save the document as required. Lastly, you can set the 'Always open Document Information Panel' on the Content Type as necessary to support the desired end user experience - enabling this will the WSPPP to open along with the document. Overall, it's a good thing to see the WSPPP in Word 2016 - the Document Information Panel provided a necessary tool in managing metadata in SharePoint documents, and it was sorely missed by many. I'm addicted to coffee. There, I said it. Based in Vancouver, I'm a technology generalist with specific focus on Microsoft SharePoint, Office 365 and the Infrastructure that it relies on. The content of this site will reflect this focus, although this may change from time to time as inspiration strikes me. When I'm not working with technology I like to ride my bicycle, sip espresso and spend time with my kids. The opinions expressed on this site are completely and solely my own and are intended as such. Any reference to trademarks, copyrighted materials or products are owned by the respective trademark or copyright holders. All images and articles are copyright Raymond Tishenko unless otherwise noted. Feel free to link to anything you find useful on this site - all I ask for is attribution. I'm based in the Vancouver, BC area and am available for contract work or a discussion over coffee anytime.